Warrandyte has always had some form of river crossing at the site of its current bridge. Before the time of bridges, punts were used to cross the Yarra into North Warrandyte. The first bridge was built in 1861, located behind the present day Museum, off Yarra St.and replacing the old punt. Heavy floods in 1863 washed away this early structure, and a new higher bridge was built in 1875, made almost entirely from local timber, sited about 50 m west of the current bridge. It stood for some 90 years until 1957 when the current bridge was constructed from new materials, using concrete and steel. In 1934, the Yarra flooded, and the water level covered the old bridge. Images of the 1940s show the wooden bridge almost completely submerged, and many of the lower lying streets inundated. The level of the Yarra is regulated by outflows from the Upper Yarra Dam, commissioned in 1957, which meant that maximum river height next to the village has never reached the flood levels experienced in previous years. During the summer months, the river level can drop to very low values, exposing rocks and the remains of the old coffer dams. There are several places opposite Yarra St where it is possible to cross the Yarra on the rocks. Height markers exist on the south bank next to the "flying fox", behind the Museum. This is very close to the site of the early punt. fire does take hold in the area. Warrandyte's residents are constantly aware of the risk bushfires pose to the area and most are well prepared with evacuation plans and bushfire preparations. 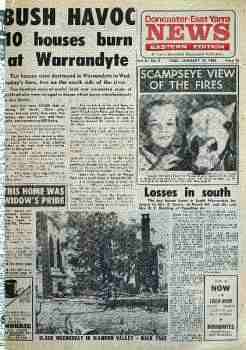 Major bushfires have swept through Warrandyte throughout history, and the town was at the centre of the Black Friday bushfires in 1939, in which 71 people lost their lives. Many examples of Colonial Architecture have been destroyed by bushfires, however, there are still a few original buildings that still survive to this day. Recent attempts by the Warrandyte CFA at backburning sections of bushland to minimise fuel for fires during the bushfire season if a major fire does take hold in the area. See Warrandyte 1930 Black Friday Bushfires report from the Melbourne "Argus"
Warrandyte Urban Fire Brigade, a fully volunteer brigade of the Country Fire Authority of Victoria is located at the intersection of Harris Gully Road, Warrandyte-Heidelberg Rd and Yarra St. It was registsered with the CFA in October 1945, and the present station was built in 1981. The Brigade is one of over 1200 volunteer fire brigades involving about 58,000 volunteer firefighters, over 400 career firefighters and officers and over 700 career and support administration staff, operating under the Country Fire Authority (CFA) banner throughout Victoria. Visit Warrandyte Fire Brigade for all details about activities and the types of emergency and other services provided.